A big congratulations to Tony Craddock who take part in the Yorkshire Three Peaks in June... Tony managed to finish the gruelling 25 mile hike in less than 6 hours which is an amazing achievement. 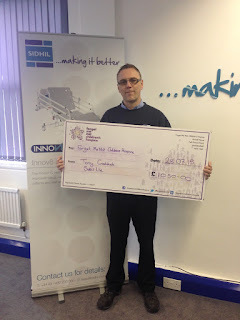 He also managed to raise over £1000 for our chosen charity Forget Me not!! Here is is with his massive cheque!! Maybe he will try and do it in less than 5 hours next year? Yes Tony?! !